#12. 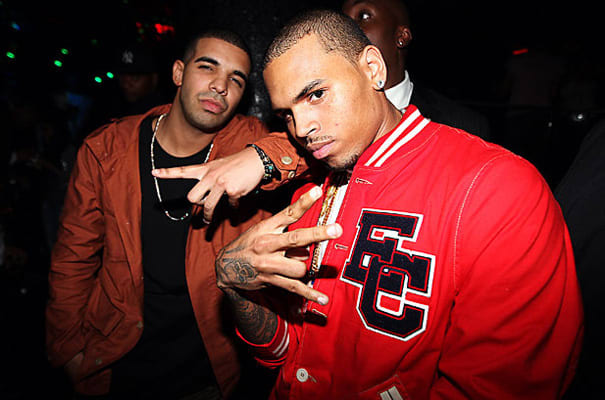 Chris Brown f/ Kanye West, Drake, T.I., Rick Ross, Fabolous, Andre 3000 "Deuces (Remix)"
No, we still don’t forgive Chris Brown. But that doesn’t mean we won’t rock with him when he gets together an all-star cast of rappers who all come through to kill his remix. Drizzy opens the door like a gentlemen, T.I. spits one of his better post-prison verses, Kanye absolutely ethers Amber Rose a former lover, and Andre 3000 actually raps! The only drawback was the multitude of versions that existed, none of which had all the best verses with all the curses. Even then, this is still the anthem for when you and your lady decide to go your separate ways.